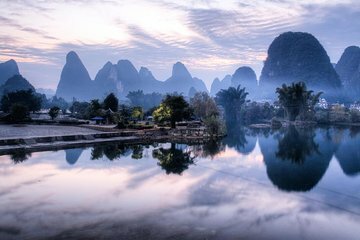 Journey through Guilin’s enchanting landscapes on this full-day tour of the region’s highlights from Shanghai, including lunch and round-trip flights from Shanghai to Guilin. Keep your camera close by as you journey through the dramatic karst landscapes, stopping to admire natural landmarks like Elephant Trunk Hill and take in the views from the 203-foot (62-meter) peak of Fubo Hill. After lunch, venture underground to view ancient artworks in the Thousand Buddha Cave and explore the beautiful Reed Flute Cave. This is by far the most bizarre tour we have ever experienced any where in the world. Our guide was Maggie and she's by far one of the lower quality tour guides we've ever experienced. Maybe the worst. Guilin itself once we reached our destination we enjoyed ourselves but it was not by any assistance from Maggie. The airport pick up from our hotel to the airport for this trip was supposedly driven by a man who claims he was the tour leader for the company....hmmm, well, we barely made our flight to Guilin on time. By the time we got to the gate, the flight was already boarding. We were not offered to ability to upgrade to better seats, was just directed to walk straight into airport towards the security line by ourselves. Once we got to Guilin, Maggie walks up to us as she wasn't prepared with a signage with our name or anything as she must have seen we were searching for our guide. The entire trip in Guilin, Maggie just walked ahead of us by several steps without looking back to check on us at all. At times we were left to fend for ourself by local hackers trying to sell trinkets unrelentlessly blocking our ability to walk forward until at one time, I literally yelled back at Maggie to assist us in letting them know we were not interested. Maggie was literally right behind me witnessing the entire experience and said nothing. At lunch, the food was good but again, Maggie walked us in and she went straight to the wash room and didn't give us any further details about what to expect, whether we should wait for her or not, etc. It was such a terrible service experience that my husband and I tried our best for a earlier flight back to Shanghai. Unfortunately, Maggie tried and couldn't help us with that either. DON'T BOOK THIS TRIP WITH THIS COMPANY. I forgot to mention the best part, when we got to our first destination, the tour van was confiscated by the local law enforcement and my husband and I were questioned about how much we paid for the tour in USD. As Maggie was directing us to walk towards the entrance of the first stop, we could hear the loud argument between the driver and the local park officers, WEIRD! At the end of the first tour, we were met with a different driver and car, we asked Maggie what was going on, she shrugged her shoulders and said she didn't know. Guilin caves and parks are worth seeing but not with this tour. Absolut perfect oraganized. They picked me up at the hotels, brought me to the airport. At guillin Airport was waiting my guide. She was excellent informed about the tour. Ijust can recommend this tour for everyone. Our plane was delayed three hours and we sat on the tarmac in a very noisy plane, but when we got there Maggie was there with a smile and ready to go. she took us on an amazing tour. We got to see everything we planned and she was a delight after a not too good start. it was well worth the trip. The Guilin mountains are worth a visit but the tour should include a trip into the mountains. Viewing them only from view points within Guilin and leaving us about 4 hours time to spend on ourselves was very unexpected. Not a good value for the price paid.